On Tuesday, October 3, 2017, Eugene N. Parker, professor emeritus at the University of Chicago, visited the spacecraft that bears his name: NASA’s Parker Solar Probe. This is the first NASA mission that has been named for a living researcher, and is humanity’s first mission to the Sun. Parker proposed the existence of the constant outflow of solar material from the sun, which is now called the solar wind, and theorized other fundamental stellar science processes. On Oct. 3, 2017, he viewed the spacecraft in a clean room at the Johns Hopkins Applied Physics Laboratory in Laurel, Maryland, where the probe was designed and is being built. He discussed the revolutionary heat shield and instruments with the Parker Solar Probe team and learned how the spacecraft will answer some of the crucial questions Parker identified about how stars work. NASA’s Parker Solar Probe is scheduled for launch on July 31, 2018, from Cape Canaveral Air Force Station, Florida. 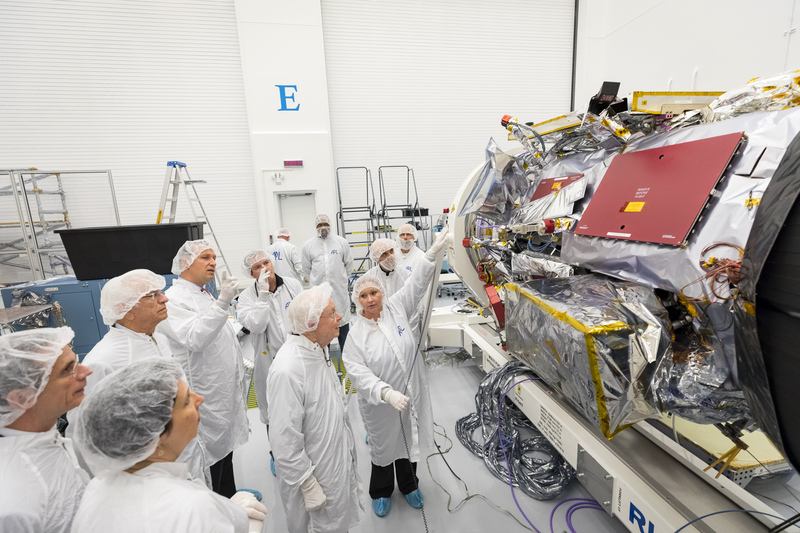 The spacecraft will explore the Sun’s outer atmosphere and make critical observations that will answer decades-old questions about the physics of stars. The resulting data will also improve forecasts of major eruptions on the sun and subsequent space weather events that impact life on Earth, as well as satellites and astronauts in space. 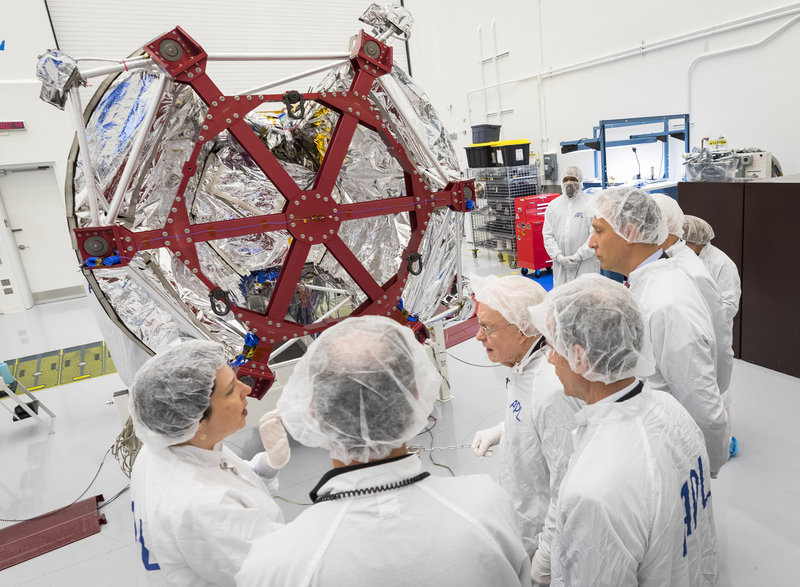 Eugene Parker, professor emeritus at the University of Chicago, visits the spacecraft that bears his name, NASA’s Parker Solar Probe, at the Johns Hopkins Applied Physics Laboratory in Laurel, Maryland, where the probe was designed and is being built. The large black structure is one of the spacecraft's massive cooling radiators. The spacecraft is humanity’s first mission to a star – it will travel directly through the Sun’s atmosphere. Members of the Parker Solar Probe team and NASA and APL leadership listen to the mission's namesake, Eugene N. Parker, center, on Oct. 3, 2017 in the spacecraft clean room at Johns Hopkins Applied Physics Laboratory. 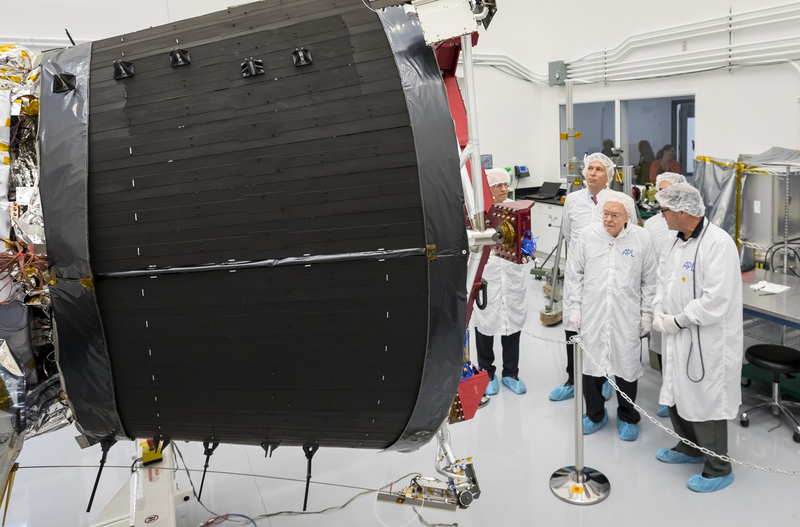 Eugene Parker (center), professor emeritus at the University of Chicago, visits the spacecraft that bears his name: NASA’s Parker Solar Probe. Thomas Zurbuchen (bottom right), the Associate Administrator for NASA’s science mission directorate, and Ralph Semmel (behind Parker), the director of the Johns Hopkins Applied Physics Laboratory in Laurel, Maryland, where the probe was designed and is being built, joined the tour. Eugene Parker, professor emeritus at the University of Chicago, visiting the spacecraft that bears his name: NASA’s Parker Solar Probe. 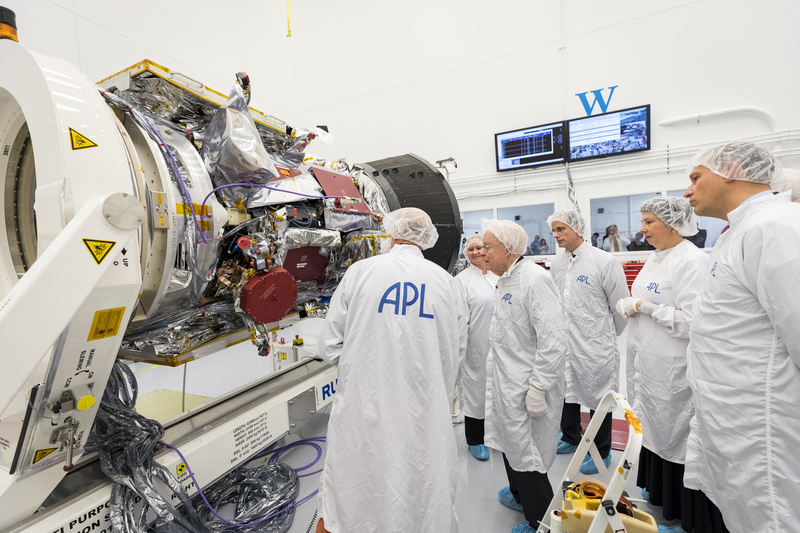 Engineers in the clean room at the Johns Hopkins Applied Physics Laboratory in Laurel, Maryland, where the probe was designed and is being built point out the instruments that will collect data as the mission travels directly through the Sun’s atmosphere. Nicola Fox (bottom left), project scientist for NASA’s Parker Solar Probe at the Johns Hopkins Applied Physics Laboratory in Laurel, Maryland, describes the mission to the scientist for whom it’s named: Eugene Parker (middle). Eugene Parker first proposed the existence of the constant outflow of solar material from the sun — now called the solar wind — through which the spacecraft will travel. The red frame on the end of the spacecraft is a stand-in for the mission’s thermal protection system, which will reach temperatures of 2,500 degrees F during its journey.